St. Louis Arsenal (1827-Present) - Established in 1827 in St. Louis, Missouri. Still in use as a military installation. Established as a replacement for the 22 year old arsenal at Fort Bellefontaine. The arsenal was constructed on 37 acres, three miles south of St. Louis, within sight of Jefferson Barracks. The main arsenal building was 120' by 40' and three stories tall. 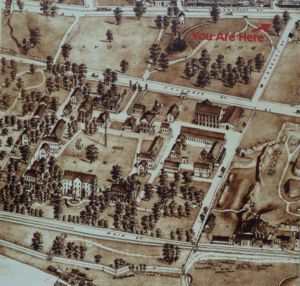 By 1857 the complex had grown to about 25 buildings and included the powder magazines, barracks, support buildings and a hospital. The entire complex was surrounded by a 10 foot stone wall. The St. Louis city limits had also expanded and the arsenal found itself inside those city limits and a hazard to the community. Efforts were made to close the arsenal but the looming U.S. Civil War change that planning. As the U.S. Civil War became inevitable the commander of the Arsenal, who was a southern sympathizer, had secretly agreed to turn over the Arsenal to the State of Missouri if it seceded. Captain Nathaniel Lyon arrived 6 Feb 1861 and fortified the Arsenal against the secessionists and by the start of the war on 12 Apr 1861 he had become the commander. 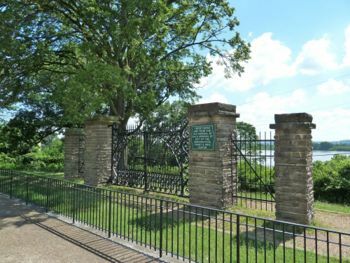 A brigade of volunteer Missouri militia under Confederate Brigadier General Daniel M. Frost established Camp Jackson (4) west of the Arsenal on 6 May 1861. Captain Lyon perceived the establishment of the Camp as a direct threat to the Arsenal and marched on Camp Jackson on 10 May 1861. Captain Lyon moved four regiments of volunteers and a battalion of regulars to surround the Camp. He placed his artillery above the Camp on present day Olive St. and Grand Avenue. General Frost was compelled to surrender and some 1000 militia were captured and marched off to the Arsenal. The citizenry surrounding the Camp began to attack the Union troops and the troops fired upon the attackers, killing 28 and wounding about 100 citizens. One Union officer and one enlisted man were killed. The prisoners were kept at the arsenal until they were paroled. Captain Lyon was able to control the situation and the Arsenal remained in Union hands throughout the war playing a significant role in arming the Union forces in the west. In 1863 the Arsenal was expanded and employed 700 civilians and 150 children who made rifle cartridges. After the war the Arsenal became the collecting point for surplus and captured arms. The Arsenal sold off and melted down the returned arms and by 1871 that role was complete. From 1871 to 1879 it served as a recruitment depot for the cavalry and after that it was a quartermaster clothing depot until 1923. From 1923 to 1952 it was a medical supply depot. 1840 1848 Capt. Bell, William H. 235 He was promoted to Major, Mar. 25, 1848. 1855 1855 Capt. Thornton, William A. 403 He relinquished command of the post before Aug. 31, 1855. 1861 1861 Capt. Hagner, Peter Valentine 866 He was promoted to Major, Aug. 3, 1861. 1861 1862 Capt. Callender, Franklin Dyer 993 According to this officer's entry in Cullum's Register; conflicts with the following. 1861-09-01 1861-12-31 Capt. Granger, Gordon 1265 According to this officer's entry in Cullum's Register; conflicts with the preceding. 1878-07-20 1886-08-28 Capt. McGinness, John Randolph 2003 While commanding post, he was promoted to Major, June 1, 1881. Since 1952 the post has been used to produce maps and charts for U.S. military forces and intelligence agencies. Now occupied by the U.S. Air Force National Geospatial-Intelligence Agency. Some of the original stone buildings remain and have been repurposed. Location: Southeast corner of Second and Arsenal Street across from Lyon Park, St. Louis, Missouri. This page was last modified 07:06, 7 April 2016 by Bill Thayer. Based on work by John Stanton.